I have so thoroughly enjoyed finding new friends through all of this Teachers Write fun! Andy has been visiting my blog on Sundays as well as Kate and Gae's blog during the week. I asked him to share how he is thinking about applying all of the summer Teachers Write! fun to his teaching when school starts again this fall. Really quickly, I just want to say thank you and hooray for everyone who is joining in this summer! It really is important that we are writing to help our students be writers, too! As we navigate our way through Teachers Write, there is definitely an important theme throughout about being organized. From as far back as June 4th and Kate’s post about “Making Time,” we have learned about the importance of staying organized with our writing and “making time” in our day to write. Since that post about organizing time, we have read about organizing our writing (June 11th – Outlining/Calendar) and critique groups (June 14th). We have all learned so much this summer. 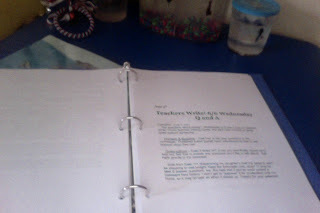 And if you are like me, an avid reader, a newbie writer, and a teacher who is passionate about teaching children (I realize that I just described nearly everyone following along), you want to organize all of this information to use during the school year. 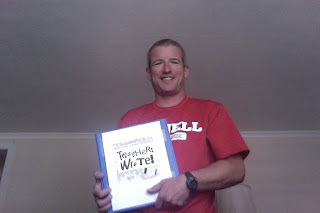 The school year is just a few short weeks away (for me it’s still many weeks away – I hate to rub it in, but I taught for almost the entire month of June in a hot, humid, and teenage smelly middle school – temps were in the 90’s on the last week), so it is time to start planning how you will utilize what you have learned this summer. You know that if you don’t plan to use this wonderful Teachers Write knowledge in August, November will arrive and you will be doing the same thing as last year. I think I can help save you from this. the time to organize the information now will help when the school year begins. And that leads us to the next topic – Utilization. The entire reason you organize information it to use the information (Research 101). We all teach in different grade levels, different socio-economic and cultural settings, with different material, and to different students, so some of these suggested activities may not work for you, but feel free to tweak and adjust the activity to fit into your classroom (if it fits perfectly – steal it!). These are just some of my ways that I will utilize Teachers Write this year in the classroom. I hope that you will answer my question (below) and share some of the ways you will be utilizing this information. Thank you for taking the time to read this and a SPECIAL thank you to Jen for letting me share (this is the first time I have ever shared on anyone’s blog – my shirt is covered in sweat and I am feeling a bit dizzy). I’ve been dying to do this! Remember this line from Wonder: I think there should be a rule that everyone in the world should get a standing ovation at least once in their lives. Today is the day that we give Kate, Gae, Jen, and all of the authors that have shared (or will share) a standing ovation. Join me. I am standing and clapping like crazy. Thanks again! Thank you, Andy! Don't you just love how organized Andy is with his binder? 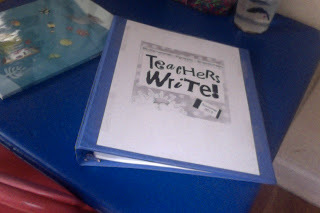 Teachers Write is really an experience to grow as writers but also as teachers. 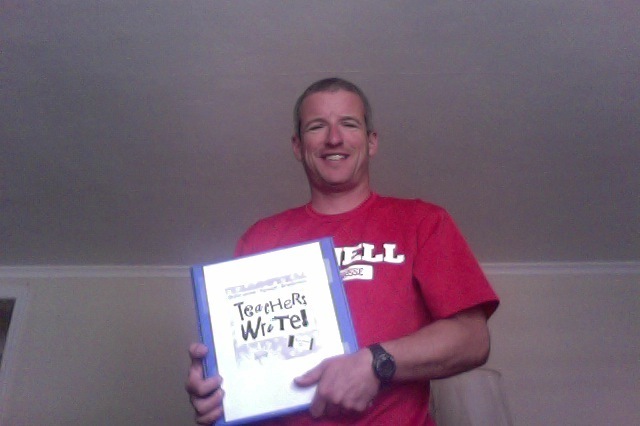 I love how Andy is already thinking ahead to how to use the activities that have worked for him with his students! How will you use the Teachers Write writing lessons in your classroom? I have been writing but it's really been every other day this past week because I had a workshop too on using Research Labs in the classroom. I could see how writing strategies I learned can blend with the research labs too. In the week ahead, I want to go back and review the work in progress writing and the strategies and do some reflecting on where I am at this point...to pull it all together! Thanks for the inspiration!